After the 2018 midterms, the lame-duck GOP legislature convened to pass bills that curtail the power of incoming Democratic officials and restrict early voting. 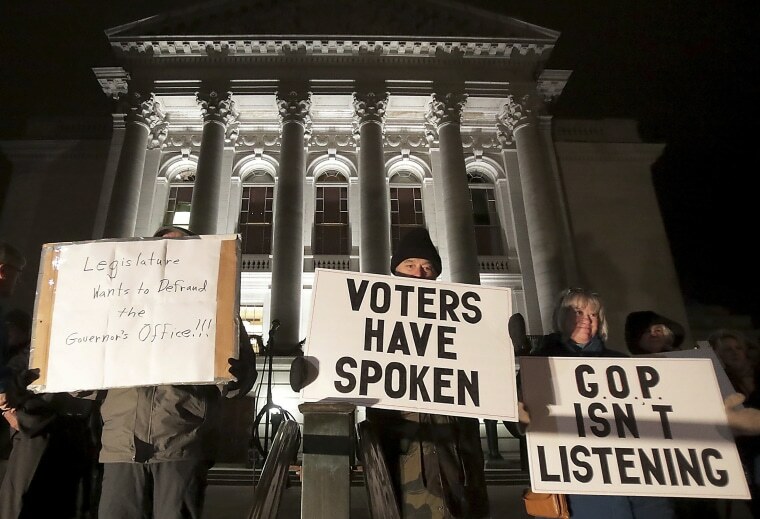 MADISON, Wis. — A judge on Thursday temporarily blocked Wisconsin Republicans' contentious lame-duck laws limiting the powers of new Democratic Gov. Tony Evers, who immediately used his restored authority to pull the state out of a multistate challenge to the Affordable Care Act. Dane County Circuit Judge Richard Niess brushed aside GOP concerns that the move would leave thousands of statutes passed in so-called extraordinary sessions susceptible to challenge. Republican legislative leaders vowed to appeal. The order is part of a lawsuit filed by a coalition of liberal-leaning groups. They allege the Legislature met illegally when it passed the lame-duck bills in December. Lawmakers convened in an extraordinary session, which is a previously unscheduled floor period initiated by majority party leaders. The groups maintain that the Wisconsin Constitution allows lawmakers to convene only at such times as scheduled in a law they pass at the beginning of each two-year session or at the governor's call. Attorneys for the Legislature say that argument is absurd and that the Legislature has used extraordinary sessions for decades. They warned Niess that adopting the liberal groups' position could leave more than 3,000 pages of statutes passed during such sessions vulnerable to legal challenges. The Legislature's attorney, Misha Tseytlin, said during a hearing this week that such a scenario would be a "rolling disaster." Niess wrote in his order that he can't uphold the lame-duck session and remain true to the state constitution. "Failure by this Court to enjoin the execution of void laws cannot be seen as anything other than irreparable harm to a constitutional democracy such as ours," Niess wrote. The judge refused to grant Tseytlin's request for a stay and called the lawyer's warning that an injunction would create legal chaos an "alarmist domino-theory." The lame-duck laws prohibit Democratic Evers from withdrawing the state from lawsuits without legislative approval, preventing him from delivering on a campaign promise to remove Wisconsin from a multi-state lawsuit challenging the Affordable Care Act. Evers ordered Democratic Attorney General Josh Kaul to pull out of the ACA lawsuit less than two hours after Niess handed down his order. The laws force Kaul to seek permission from lawmakers before settling any lawsuits and to deposit settlement awards in the state's general fund rather than in state Department of Justice accounts. The measures allow lawmakers to intervene in lawsuits using their own attorneys rather than Kaul's DOJ lawyers. The statutes also restrict early in-person voting to the two weeks before an election. In the past, municipalities could set their own hours. Assembly Speaker Robin Vos and Senate Majority Leader Scott Fitzgerald, both Republicans, promised to appeal. They said in a joint statement that Niess has created chaos and questions about laws passed during previous extraordinary sessions. The governor issued a statement calling the ruling a victory. "The Legislature overplayed its hand by using an unlawful process to accumulate more power for itself and override the will of the people, despite the outcome of last November's election," he said. Niess' order will remain in place until he or an appellate court lifts it. The coalition's lawsuit is one of four actions challenging the lame-duck laws. Five labor unions have sued in Dane County arguing that the laws steal power from the executive branch and transfer it to the Legislature, violating the separation of powers doctrine. The state Democratic Party has filed a federal lawsuit contending that the lame-duck statutes violate free speech and equal protection guarantees. The party insists the laws amount to retaliation against Democrats for their political viewpoint, prohibit them from enacting policies they support and dilute their votes. Liberal advocacy group One Wisconsin Now challenged the early voting restrictions as part of a larger federal lawsuit challenging Republican-authored voting. That suit is currently before the 7th U.S. Circuit Court of Appeals. U.S. District Judge James Peterson struck down the early voting limits in mid-January, but that decision has been folded into the larger appeal and could be overturned.